Speed level: level indicator: 1-4 levels, the wind force is stronger level by level. Undervoltage protection: When the battery voltage is lower than 3.4V, the red indicator light flashes quickly. When the voltage is less than 3 V, the mini fan will shutdown automatically. 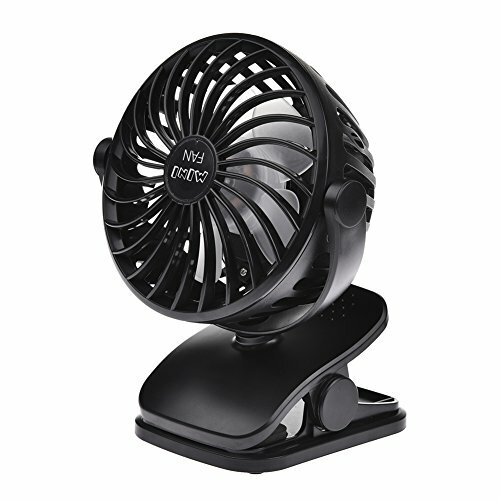 USB Rechargeable available,you can use computer,charger,power bank to charge the fan .The With 2500mAh battery. 360° rotatable head ,can adjust the wind angle optionally. Multifunctional clips,you can clip it on baby stroller, home and office, laptop, gym workout, outdoors, camping, trips, etc. 4 level wind speed adjustable,to meet different moments.Size:about 5.5*7in. Noise: less than 36db.Use high quality ABS, dense mesh cover ,safe and not easy to deform. If you have any questions about this product by Per, contact us by completing and submitting the form below. If you are looking for a specif part number, please include it with your message.